Choose a page number to see the recommended websites and downloadable pictures. Find out about some of the most exciting dinosaur fossil discoveries. Watch a clip about one group of dinosaurs that lives among us today - birds. Explore the dinosaur webpages of the American Museum of Natural History, with facts, video clips and news about discoveries. See the fossil skulls of some early humans. A comprehensive introduction to world history from prehistoric times to the start of the 21st century, including information on dinosaurs, the first humans, Ancient Egypt, Greece and Rome, Medieval Europe, the World Wars and other major events in history. Magnificently illustrated with a wealth of images depicting key events and everyday life in times gone by, as well as maps, charts and photographs. 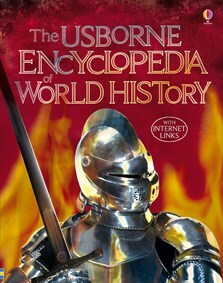 Includes a 12,000-year illustrated timechart, glossary and extensive index. With over 800 internet links to regularly reviewed websites with homework help, virtual tours, reconstructions, games and quizzes. It would be an excellent ‘spine’ for your history studies. There are many internet links throughout the book which invite the child to explore and learn more about a historical event or time period, as well as links to free downloadable maps and pictures. These internet links would have taken me ages to source, this book has done it all for you.